Minamoto Yoshitsune should not have been a samurai. But his story is legend in this real-life saga. This epic warrior tale reads like a novel, but this is the true story of the greatest samurai in Japanese history. When Yoshitsune was just a baby, his father went to war with a rival samurai family—and lost. His father was killed, his mother captured, and his surviving half-brother banished. Yoshitsune was sent away to live in a monastery. Skinny, small, and unskilled in the warrior arts, he nevertheless escaped and learned the ways of the samurai. When the time came for the Minamoto clan to rise up against their enemies, Yoshitsune answered the call. His daring feats and impossible bravery earned him immortality. I picked up this book at the American Library Association Conference and didn't realize at first that this was going to be a required read. After learning this, my interest level did pick up a bit more. I was excited to dive into a book and learn about the story of a Samurai legend in the making. Did I particulary like this book? Not really. However, that does not mean you should not check it out. 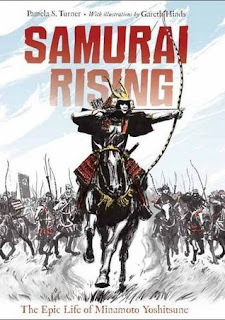 Turner does a fantastic job of weaving together the story of a boy's broken family and his uprising with cultural facts of the samurai's history. This story does a marvelous job in showcasing the war, politics, family life views in Japan during the 12th century. I do believe that writing a non-fiction book readable and appealing to teens can be a daunting task as the author wants to make sure they keep as close to the events as accurately as they can. The one thing that hurt the novel for me was I felt that this felt more of a bullet point timeline versus a story that followed a timeline. Overall, Turner does a marvelous job in telling the story of samurai warrior who has gone down in history till the end. With a history lesson morphed into a literary masterpiece, this a book not worth skipping.